Choosing a host can be difficult and challenging task. There are lots of hosts to choose from and it can be difficult determining their pros and cons. It’s hard to get unbiased reviews because there are a lot of reviews that want you to buy a product or service through their affiliate link. They tell the good, but not the bad. You need to know the pros and cons before making a decision on something as important as hosting. It’s best to make the right decision the first time. It’s far more convenient and economical to choose your hosting correctly the first time than moving your website to a new host later. You need Hosting Facts. Hosting Facts is a review service that actually tests the hosts by obtaining a hosting plan at their own expense and creating a test website. They don’t use affiliate links for those hosts, so they can remain unbiased. Let’s take a look at how Hosting Facts helps you choose the best host for you. They evaluate the offer including the plans and fees. They sign up and evaluate the payment process. They check the account activation process and determine how user-friendly it is, how long it takes, what the steps are, and then install WordPress. Next they monitor performance of uptime and page-loading speed using data from Pingdom.com. They test support by checking how long it takes to answer 3-4 questions and evaluate how accurate their answers are. Finally, they combine all the results into a final score between 1 and 10 (the higher the number the better). The results are shown as charts. The scores are color-coded from green (best) to red (worst). They use Pingdom.com to help them track metrics, such as speed and uptime data, for hosting companies. This information can tell users if a host is worth the investment. Now that you know what Hosting Facts does, let’s see how to use it and get the most from it. Charts for each host provide information that’s easy to follow and read. In case you have trouble though, instructions are provided to help readers understand each of those aspects and how to read the charts. The charts provide the logo and name of the company, and information for price, uptime, and page-load speed. Next is four circle charts that graphically show a score for each metric. Following this is a section with the overall score, and links to the review and the host’s website. 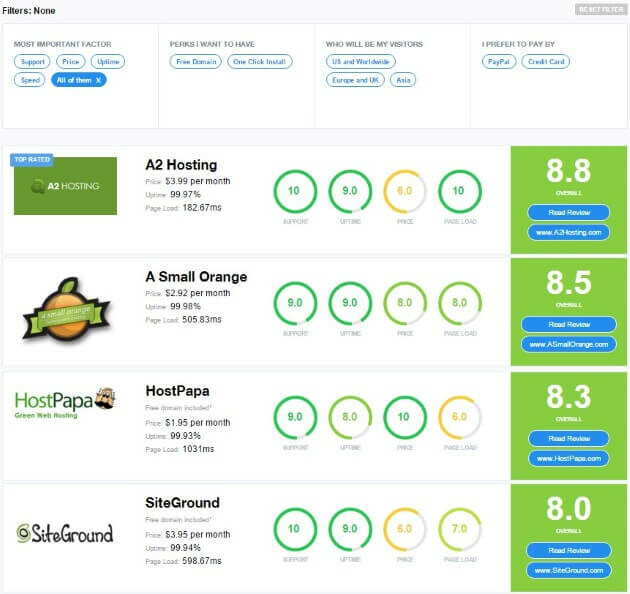 They’re arraigned in order from the highest to the lowest rated host and can be sorted by overall score, uptime, speed, price, and support so readers can choose a hosting provider based on what’s the most important to them. Once the reader has found something of interest, they simply click to read the review or go to the host’s website. The reviews have a nice structure that’s easy to follow and includes bullet-points and charts. The text is easy to navigate and skim to find the information you’re looking for. The writing is clear and easy to read. Information includes the ranking number, year it was founded, the metrics found in the charts, and an analysis of their customer support. They give an overview of the types of plans the host provides and the plan they’re reviewing. They buy the hosting plan and create a test site for the review. The reviews include a link to the test site. Hosting plans were tested for around six months. Scores range from 1 being worst to 10 being best. Reviews even include actual customer reviews. Hosting Facts pays $10 for these reviews. They ask customers to focus on specific points and to include both good and bad experiences. These reviews range from 50-200 words and include an overall score. Here’s what I thought about three of the reviews. Bluehost ranks number 8. It gets an overall score of 7.5. They were most impressed with Bluehost’s uptime. Over a period of six months they had a 99.99% uptime. The six-month average for load-time was 964ms. Support was low due to a 43 minute wait-time. The review was updated December 18, 2015. There are three customer reviews that average a score of 9.6. All reviews were from December of 2015. Customers specifically mentioned they liked the price, interface, performance, and support. There are a few places where the statements in the article do not match the rankings. I suspect the rankings in the charts have been updated but the article has not. The article ranks them overall at 12th place. Also, the article states that Bluehost gets the lowest score on the list for load-time, however the charts show five other hosts with a lower score. Hostgator is ranked 20. The listing in the summary shows it in 19th place. The overall score is 6.8. The article shows an uptime of 9 (with an average uptime of 99.95%) while the chart shows a score of 6. The page-loading speed was an average of 938ms. They were pleased with the support as wait-time was only 16 minutes during peak time. The review was updated December 8, 2015. There are two customer reviews with an average of 9.25. Customers say it’s great for beginners and small websites but recommend upgrading your plan as traffic increases. Reviews were from December of 2015. This review had some language that isn’t professionally appropriate. It also gets chatty about uptime and load-time. It ends with a statement of Hostgator being in the top ten when the charts show them at 19. 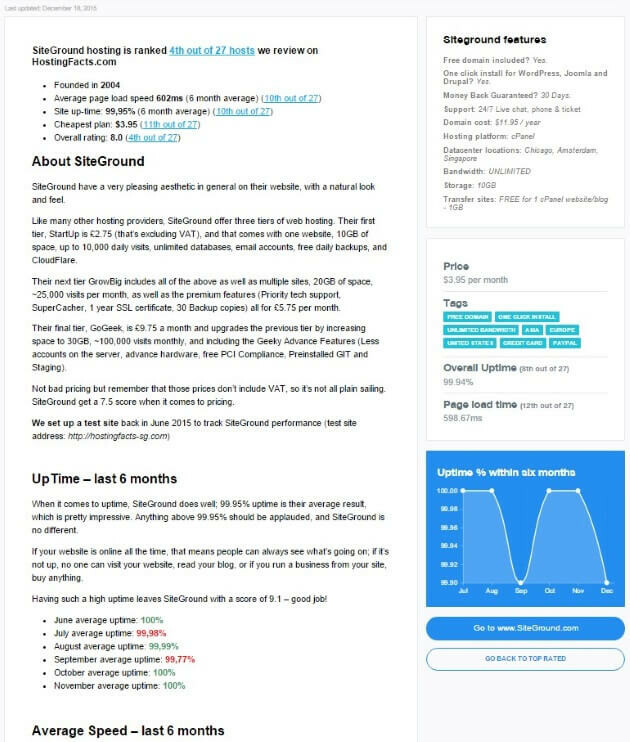 Siteground comes in at number 5. The summary shows it at number 4. It gets an overall score of 8.0. Uptime on their test site ran an average of 99.95%. The page-loading speed was a slow 631ms. They were most impressed with their support. They responded in 11 seconds. Support gets a score of 10. The review was updated December 18, 2015. There are four customer reviews with an average of 9.4. They specifically mentioned they liked the price, uptime, support, and the ease of running a WordPress site with the hosting plan. One mentioned it was difficult to get them to answer questions. All are from December of 2015. The chatty dialog is the exact same text as from the Hostgator article. Just like the other articles, scores within the article do not match the charts. Scores included an overall 8.3 and a ranking of 3rd place. For documentation they provide several tools, guides, and tutorials. 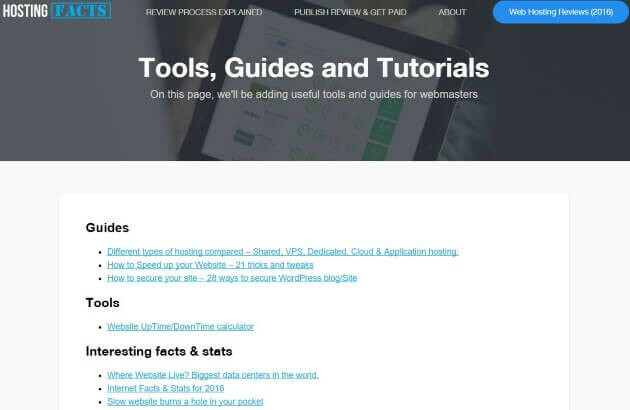 The guides explain what the different types of hosts are, how to speed up your website, and how to secure your website. There’s an uptime/downtime calculator. Tutorials talk about data centers, facts and statistics of the Internet, and how a slow website loses you money. The articles are well-written and include nice Infographics. If you need help you can contact them using their Contact Form. Pricing – Does it Cost Anything? Hosting Facts provides their information for free. For the detail and quality of the reviews, Hosting Facts is a good site to visit before choosing a host. Keep in mind though that not all popular hosts are included. I was surprised that GoDaddy, 1&1, and others were not in their listing. 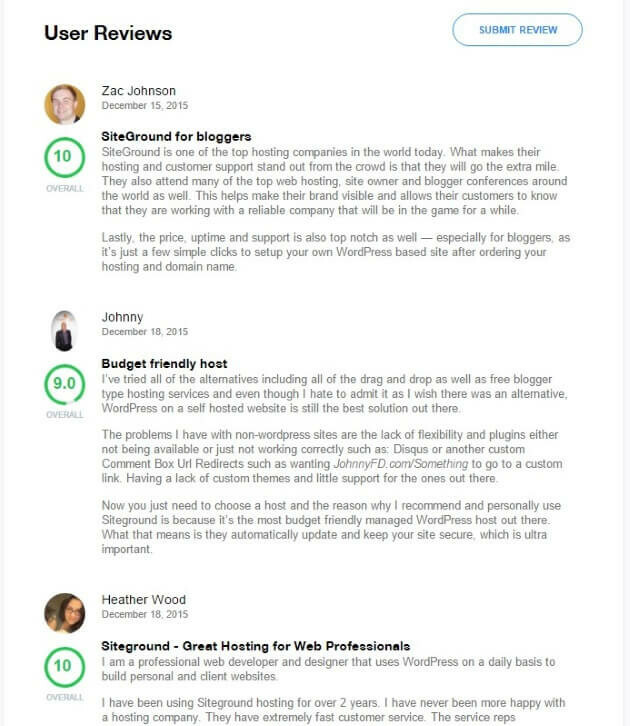 With that in mind, Hosting Facts isn’t the only review site you need but it should be high on your list. Their reviews seem to be unbiased and trustworthy. The reviews are detailed and easy to follow. I especially liked the charts that sort the hosts in order of highest to lowest rated. The charts are easy to understand and follow without having to read a lot of information first. They stand on their own. The charts and articles have a few discrepancies in their scores, leading to confusion over which is correct. I suspect the rankings in the articles were correct at the time of writing but the scores have been updated in the charts without being updated within the reviews themselves. The charts are prominent enough that it’s easy to figure out what the true rankings and scores are. What are your thoughts on review sites like Hosting Facts? Have you used Hosting Facts or similar review sites before? Let us know your thoughts in the comments below. Hello Randy, this is a good read.I have to say here that you have done a really good job by publishing the article above. This is really going to help a huge audience searching for such reviews. Building customers trust is always essential for any business. I suggest you to go through Cloudways and include it in your list. 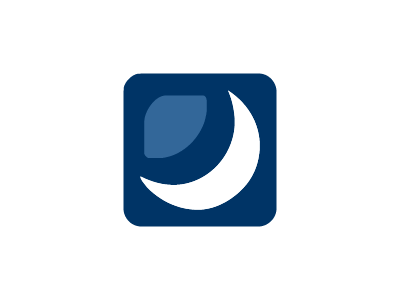 Its a super fast managed cloud hosting platform. You can explore all its features by getting started for free. Thanks for this review. I found the site to be a great resource, and have made the decision to relocate my currents sites based on their data. It will save me over $50 a year and provide a better service than I’m currently getting. Thanks for the introduction to a nice service. I like that they are actually signing up for each service anonymously. I recently put together a slightly different take on WordPress-only hosting services, comparing the features side-by-side. If you’re looking for a specific feature, you can search for it and compare each host. Thanks for the link Dave, the table definitely gives a great quick overview of what those hosts can offer when compared side by side. Something like this can certainly help any beginner (or not) weed out the hosts that won’t suit their particular needs.